To cite: D Suba Chandran. 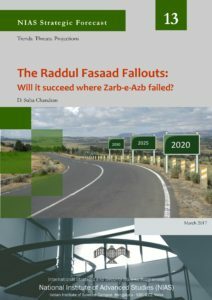 “The Raddul Fasaad Fallouts: Will it succeed where Zarb-e-Azb failed?,” NIAS Strategic Forecast No. 13. Bangalore: International Strategic and Security Studies Programme, National Institute of Advanced Studies, March 2017. February 2017 was perhaps one of the worst months in Pakistan’s recent history. A major suicide attack on a rally in Lahore in Punjab was followed by a bigger attack on a Sufi shrine (Qalandar) in Sehwan in Sindh. In between, there were suicide attacks on a court premises in Charsadda in KP. The second major attack, on 16 February 2017, also by a suicide bomber took place in Sehwan in rural Sindh (around 200 kms north of Karachi) was in a Sufi shrine (of Lal Shahbaz Qalandar); the attack was owned by the Islamic State in Pakistan. After a spate of horrific terror attacks, Pakistan has launched a new counter-terrorism offensive – Raddul Fasaad. The scope of the new military operation is larger than Zarb-e-Azb. Will Raddul Fasaad succeed where Zarb-e-Azb failed? Or, will Raddul Fasaad create more problems and have unintended fallouts for Pakistan, given the current political support (or the lack of it) and the absence of long term political objective to military operations? About the Author: D. Suba Chandran is a Professor at the ISSSP, NIAS. He works on J&K, Pakistan, and Afghanistan.